Don’t just take our word for it, there is truth to the fact that dryer burning wood burns cleaner and more thorough than burning wood that is wet, moist or otherwise saturated with water. It’s harder to start alight, harder to maintain, and water that is evaporating as steam can trap partially burned materials and make them airborne. Soot, ash, and other materials which carry harmful carcinogens can be breathed in while in this “aerosol” state. Not very good to have around, to say the least. On the other hand, dry burning wood will combust more completely and most of the wood will be reduced to carbon and other materials while fewer greenhouse gasses will be created in the process. While it is never a good idea to concentrate the gasses of any burning material in a closed environment, dry burning wood is definitely better to have around than wet burning wood. How to dry and store burning wood. Another EPA video ahead! Anybody with just a little bit of wood chopping skills can do this easy set of steps, all designed to make burning wood storage simple and affordable. In just four steps, you can take your newly purchased Dallas, Texas area burning wood from freshly cut to neatly stacked and drying out in less than the time it takes to throw back a six-pack… root beer, of course! The first step involves splitting wood no bigger than a 6″ wedge. Remember to make kindling. The cut wood should fit your fireplace or wood burning stove. And once you’re done with this, the physical part has been completed! Now, where’s that root beer? Stack your wood with the split side down. Use a pallet as a base to keep your burning wood off the ground. 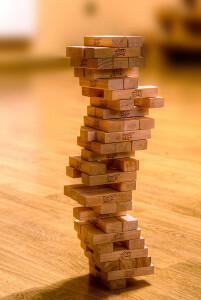 Stack the wood “Jenga” style. This allows better drying by promoting good airflow. Use a blue tarp or some other sort of top covering to keep direct rain or snow from collecting on top of your pile. No need to cover the sides. Bare sides promote better airflow and will keep your burning wood dried out. It will also be more accessible. Finally, allow for up to a year drying time for some denser types of wood. Cracks in the grain, a lighter weight, and a hollow “knocking” sound when banged against another piece of wood indicate a properly dried piece of burning wood. This video by the EPA sums it all up nicely! We want to close this post by saying that proper and regular maintenance of your chimneys and fireplaces is essential for the safety and health of you and your family. Call a reputable local chimney sweep and make sure your chimney is ready for a wintertime of burning wood. Clogged up chimneys can cause fires and a build up of harmful levels of gasses such as carbon monoxide and carbon dioxide. 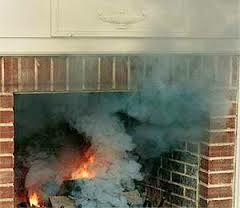 Always use your fireplace and wood burning stoves in accordance of local, state, and federal laws. And never use a chimney or fireplace that is in obvious disrepair and/or poor structure.